RSS volunteers at a camp in Shimla last year. 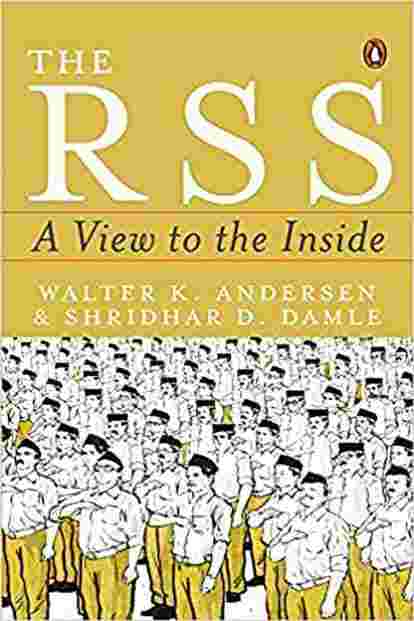 Walter Andersen and Shridhar Damle’s extensive analysis of the Rashtriya Swayamsevak Sangh (RSS), perhaps the most fascinating political organization in contemporary India, begins at an appropriate juncture. The RSS: A View To The Inside looks at the vast network of affiliate organizations—collectively known as the Sangh Parivar—that has enabled the Hindu nationalist body to spread its influence and outreach to, now, almost every corner of the nation. 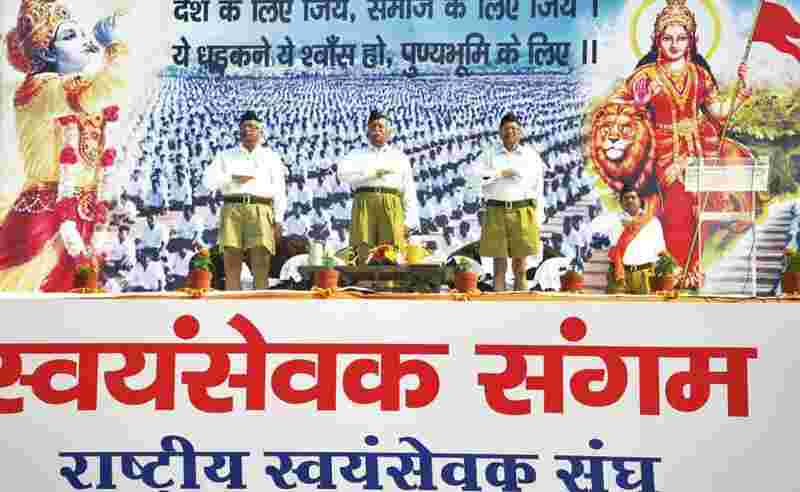 It is through these organizations that the RSS derives its unique, multivariate strength. The duo seeks to demonstrate how these various affiliates, each differing in scope, size and mission, have a bearing on the national policy decisions made by the Sangh Parivar’s best-known member—the ruling party of India, the Bharatiya Janata Party (BJP). Further, they want to show how seriously the BJP of Prime Minister Narendra Modi takes the inputs of the RSS, especially compared to the government of his forebear, A.B. Vajpayee. Andersen and Damle show that the RSS has grown with stunning speed in the last three decades, standing now as “one of the world’s largest non-governmental associations"—an amusing characterization, given the BJP government’s 2017 “crackdown" on NGOs. In 1989, the RSS carried out 5,000 service projects; in 1998, it had reached 50,000; in 2012, the number stood at 140,000; and in 2015, 165,000. What explains this remarkable growth? The authors identify the role of Madhukar Deoras, who ran the RSS from 1973-94, as crucial to this. One of their key insights pertains to how this expansion reflects in the internal tensions and debates the RSS is now able to accommodate, such as the shift towards economic liberalism. Far from being the intransigent top-led organization that it is often believed to be, Andersen and Damle liken the Sangh Parivar’s current shape to that ascribed to the Congress decades ago by the political scientist Rajni Kothari—that of a party of consensus, with a clear left, centre and right, accommodating distinct groups as they seek to influence the policy process. This portrayal is convincing to an extent, but it does create the impression of a wider range of debate than the RSS genuinely allows. Yet the authors’ discussion on the RSS and economic self-sufficiency, which gets its own chapter, is compelling. The drive towards economic liberalization, frequently championed by Modi at international fora such as the World Economic Forum at Davos, is sharply opposed by important RSS affiliates like the Swadeshi Jagran Manch (which premises its calls for redistributive policies on its reading of Advaita Vedanta), and the Sangh’s farmer union—the largest union in India—the Bharatiya Mazdoor Kisan Sangh. At first the Modi government seemed determined to ignore them. Andersen and Damle find that Mohan Bhagwat’s crucial Vijay Dashami speech, in October, to the RSS faithful “catalysed a populist turn in the Modi government’s economic policies". Hence the discernible thrust of the 2018 Union Budget, which prompted virulent criticism from economist and former NITI Aayog chairman Arvind Panagariya, where duties on a range of consumer imports were increased. The authors suggest that Modi, after the sobering results of the 2017 Gujarat state election, listened to the feedback-networks the Sangh organizations provided. The RSS is host to other intellectual conflicts, such as on the issues of conversion of non-Hindus (homecoming, or ghar wapsi, in RSS terminology), though the authors undercut their central argument here, showing that there is not any argument about whether there is actually a need to “re-convert" religious minorities to Hinduism—which is certainly the crux of the matter, but about which there seems to be little internal debate. Instead, this argument focuses on the political practicability of the movement, and the problems such far-right ideologies cause to the BJP’s goal of retaining power at the centre. This is similar to the different stances it has adopted on cow protection, depending on the political and cultural context of the region in which it is operating. There is no genuine ideological debate on the right of religious and caste minorities to eat what they like; the RSS’ ideological flexibility is predicated on the need for political success, via the BJP. Yet the authors show, convincingly, that this explains partly at least its increased strength in areas where it did not operate three decades ago. To wit, research on the spread of the RSS in the North-East makes for fascinating reading. It shows how the BJP’s recent electoral success in Assam is linked to the RSS’ vast organizational imprint, including service projects, shakhas (branches) and schools. Twenty-one RSS affiliates operate in the state now. In Meghalaya, one of the three Christian-majority states in the North-East, the RSS has been operating since 1972, but has never sought to challenge the absence of restrictions on cow slaughter and the consumption of beef. Instead, it has quietly, shrewdly, grown its base: “The RSS…had in 2016 over 6000 swayamsevaks in Meghalaya, ran fifty schools located in all eleven districts of the state and managed medical camps in about 1000 villages." One review of the book centres on Damle’s close association with American affiliates of the RSS and argues it is biased because the authors are insufficiently distanced from the subject matter. It also raises the pertinent question of why this association was not declared in the text. The authors’ portrayal of the RSS as a meeting ground of ideas does seem overblown—while there might be affiliates with a left-leaning focus in economic or some social aspects, they are still adherents of a larger, nativist, right-wing ideology that cannot accommodate, for instance, Muslim or Dalit self-assertion, but instead hopes to subsume such politics in a blatantly paternalist manner. Certainly, the organization does not encompass the wide range of ideas that would accommodate a genuine national left, right and centre. But the great learning from this new study is how fundamentally the organization has transformed itself between the authors’ last work, published in 1987, and today. Perhaps most crucial is the RSS’ current understanding that the electoral success of the BJP strengthens its ability to attract recruits and promote its ideology. The BJP’s primacy all over the country is now a vital goal of the RSS. It also examines how the vast Sangh Parivar manages to stay together. It has been surprisingly responsive, in the last three decades, to change in India (think of its decision to drop the iconic short pants after social media mockery). Within the umbrella of Hindu high- and middle-caste political action, it has come to occupy the role that the Congress once did, and replaced the Congress’ national grass-roots structure, gutted over the years as it became a family outfit, with a saffron-inflected one of its own.